I’ve been watching this metric all year. And when gold and silver took their recent tumble I checked it again. I found what I thought I would. 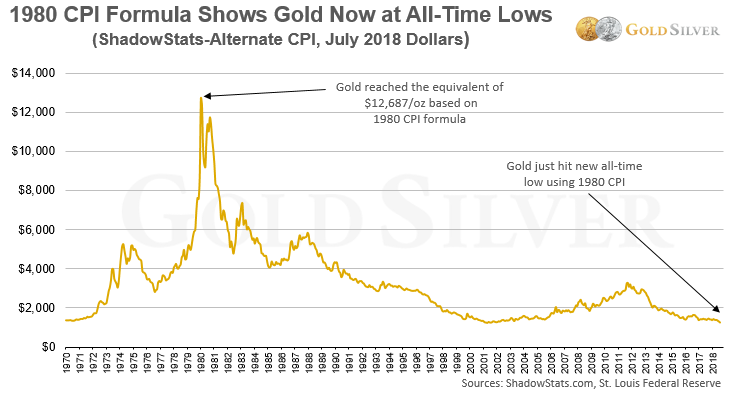 Gold and silver prices, adjusted for inflation from a more accurate measure than the CPI, are now cheaper than when they became legal to own again in the United States. This inflation adjustment is not based on the government’s Consumer Price Index (CPI), because it has changed the methodology for calculating inflation at least 14 times since 1980. And as John Williams of ShadowStats explains, those changes are always geared to reduce inflation readings. How much confidence can you put in an inflation measure that has been modified, on average, every 2.7 years and in every instance was changed to yield a formal inflation number lower than the previous formula? At a minimum, the measure would be questionable; at a maximum it demonstrates clear statistical bias, manipulation, and inaccuracy. Thus, adjusting precious metals prices via the CPI can’t give us a true measure of their values. John instead uses the same inflation methodology that was used in 1980. In other words, he uses the formula that existed before government officials started tinkering with it. The difference is enormous: the CPI reading in July was 2.9%, for example, but the ShadowStats alternate CPI was 10.75%. Which do you think is more accurate? Heck, the average gas price alone has risen 17% since 2017 — but the core CPI reading excludes food and energy costs. Have college and healthcare costs really risen less than 3%? I don’t know about you, but my experience is definitely more in line with John’s reading. I asked John to inflation-adjust the gold price using the 1980 formula. Here’s what that calculation shows. That little downturn on the far right pushed the inflation-adjusted gold price to a new modern-day low. In other words, gold is now selling below its 1970 price, when it was still illegal to own in the US! Further, you’ll see that based on July 2018 data, gold reached the equivalent of $12,687 per ounce at its 1980 peak. This combination of data shows not only how dramatically undervalued gold currently is, but just how high it could climb if it matched the inflation-adjusted ascent of the 1970s bull market. Indeed, gold would have to climb about 960% from current levels. John also adjusted silver for inflation using the 1980 formula. Its undervaluation is even more dramatic than gold’s. 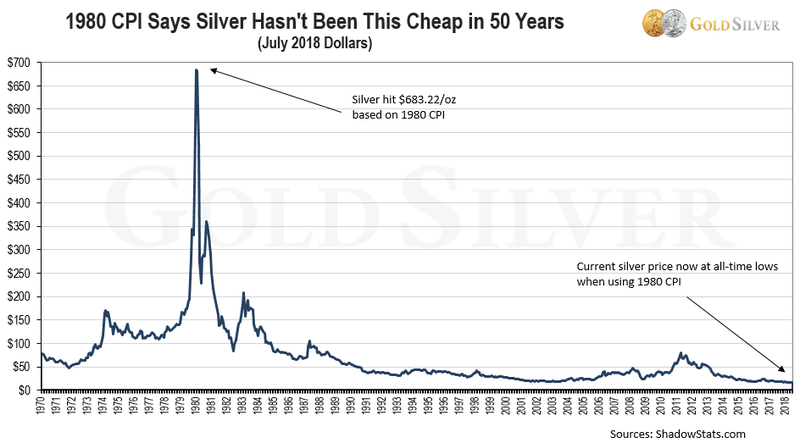 The current silver price, when adjusted for inflation using the 1980 formula, is now selling below any level it has in the past 50 years. Silver would have to climb roughly 4,711% from current prices to match its peak level during the 1970s mania. I’m not saying silver will climb to almost $700. What I am saying is that it is clearly undervalued right now and carries tremendous upside potential if it comes anywhere close to matching its 1970s performance. Whatever your personal outlook may be for markets, economies, and currencies, there’s no denying that after adjusting gold and silver for inflation, they represent tremendous value at present levels. And if Mike is right about what’s ahead, that value, if purchased today, could be life-changing.